Lilliput , by Sam Gayton, arrived on my doorstep unrequested. While it looked interesting, I really didn't feel as if I had the time to invest in it. Ultimately I decided to give it a go and if I didn't like it for whatever reason, I wouldn't feel compelled to finish it. Lilliput is inspired by Jonathan Swift's original work which was published back in 1726. I didn't realize then (too young, too immature) that Gulliver's Travels is a satirical work speaking out against the Whig political party principles. (That's all I can really tell you about that as I don't feel up to investigating all of the whys and wherefores.) Swift wrote his story about Gulliver who goes about adventuring and lands on an island called Lilliput which is full of tiny people. Gayton picks up the story of one Lillput named Lily who is captured by Gulliver and taken back to England as proof of his journeys. He keeps her locked up in a bird cage in his attic apartment for 6 of her years until she finally makes an escape, wishing to return to her homeland. I found Lilliput to be rather clever and highly entertaining. (I dare say I liked it better than my experience with the original but I wouldn't say that counts for much. Bad attitudes get in the way of good judgement sometimes. The longer this review gets the more guilty I feel for not ever having re-read Gulliver's Travels!) Lily undergoes some serious difficulties in escaping from Gulliver who, it is explained, is a man of science and wishes to make sense out of the world and prove himself to his fellow citizens, all of whom have written him off as being a lunatic. He needs to keep Lily to prove the truth of his experiences when traveling. 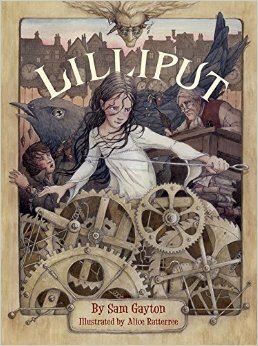 Lily ultimately escapes with the help of a young man named Finn who lives below her in a local clockmaker's shop. Finn is also a prisoner, being kept as a slave by said clockmaker to do his bidding. Both of them desire freedom and it's through teamwork that they ultimately achieve it. As I said, this is a very entertaining and engaging story and I enjoyed it thoroughly. It does have one particular theme which makes for talking points should you wish to read this for yourself or hand it over to your children. Lily, a prisoner, realizes that she's not the only one in the world who is trapped into bad circumstances. This theme pops up with some degree of regularity causing the reader to pause and try to understand what point the author is wishing to make. Do I think that it is true that we are all "caught in cages" of various sorts? Maybe. Do I think that is a politically charged question at the moment and modern literature is trying to subtly (or not) create such questions in a young reader's mind? Yes, I do. Several years ago I was reading a piece of modern literature that had some subtle passage referencing that one character was a homosexual. I remember thinking, "ah! It starts! Publishers will be working to make this the norm and not the exception." In 2015 we find this very much to be the norm and there are usually several homosexual characters present in books. There is no longer any subtly. And why need there be? Better to say it outright and upfront. It's easier to be honest than to lie. Always easier. I wish they had been bolder faster, truthfully. I have to stop and ask myself about Lilliput what the main point the author is trying to get across in this present day. Are will still locked in boxes, afraid to be the real us? Is that the point? Is it a political point or a moral one? If he's arguing a moral point then things become much more interesting to me and this would be how I would approach the book with my own kids. Lies and secrets are never beneficial and will hurt you dreadfully. Telling the truth about what you are thinking or feeling is infinitely better, although at first glance it may appear to be the harder thing. Ultimately, it is the truth that unlocks prison doors and let's us live free from a bad conscious which should be something we absolutely should work hard to do. Likewise, it is better to ask our questions aloud, with the most accurate wording to express our true meaning as possible. That is how we help minds to meet and deal with issues together in a way that is beneficial. Subtleties and slights of hands are not at all helpful. Again, I really don't know what point Gayton is ultimately trying to make. I just pause and question him, "Where are you going with this?" because modern books which are published these days give tips and clues to the direction people are heading. What Gayton wants to make his reader think about is important to know and understand. At the very least, no matter this meaning, I think this book requires discussion between kids and parents. My apologies for putting that into your mind. But parents need to know that it's there. Gayton, if you read this, you have such great talent as a story teller! I'd read any book that was placed into my hands with your name on it. Skip the potty talk. It's really beneath the best and you are one of the modern bests in my opinion. It's hard to find a piece of middle grade fiction which appeals to a reader's imagination and thought processes. Thanks to the questions about prisons, this book is full of serious questions and a good discussion. Coupled with the fact that it's entertaining and well thought through, it makes for a marvelous book. I wish it didn't include farts but it does. That's my biggest complaint. Will my kids laugh at it? Yeah. But do they need to? The book is good enough with out it. Would I recommend this book to others? Well, I wouldn't give it as a gift to anyone because I don't know that they would necessarily like it. I think its fantastic for a selective audience but I'd be choosy who I presented it to as a good read because, as I mentioned, there are exceptions that I take to. That said, it is an interesting read and if you think you could overlook the base humor at certain points, give it a read. I'd be very curious for your thoughts! Many thanks to Peachtree Publishers who sent a copy of this title in order to facilitate this review. I received no additional compensation and, should you have the slightest doubt on the matter, please let me assure you that all opinions expressed above are 1000% my very own. Jonathan Swift himself had a touch of the potty humor. I read Gulliver's Travels a good many years ago, and one thing that stuck in my memory is an incidence of Gulliver putting out a Lilliputian fire. If you need more details, I'll tell you, but I think you can imagine how.